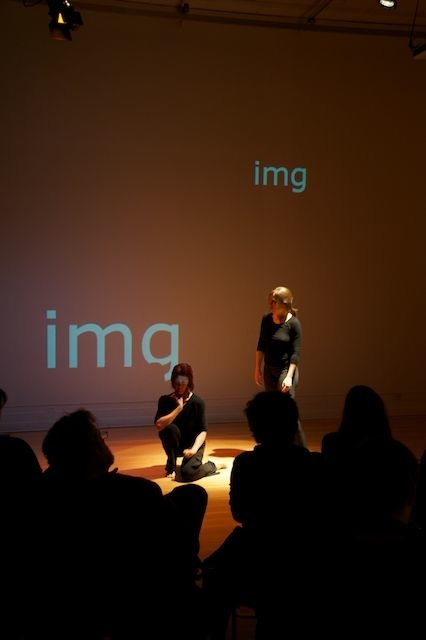 Website Annotations/Impersonations: SAIC.edu is a performance and interactive installation choreographed by Web code and twitter feeds. Website Annotations/Impersonations: SAIC.edu - a project developed for The Simulationists: Mixed Reality Performance - is part installation part performance, each influencing the other's appearance while collecting audience submission - via twitter. In the installation, which was exhibited at Rhymer Gallery/SAIC from February 1 - March 23, 2011, the audience could tweet text - their ideas and descriptions of HTML tags as movement notations - to the html-movement-library via cell phone. 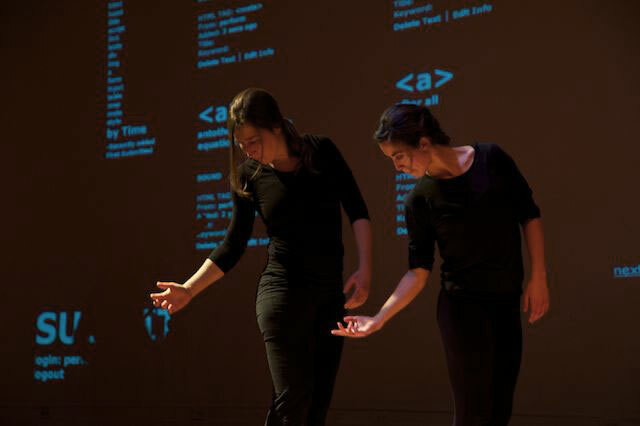 The ever-growing HTML movement archive was fed with movement annotations for performers, used during the live show, the second part of the project. 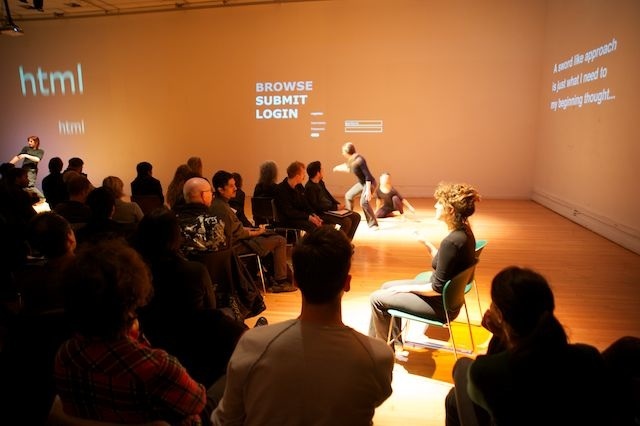 In the performance, at SAIC (The School of the Arts Institute of Chicago, which took place on February 18, 2011, four dancers - and the audience - were joining me in performing the school's website code as a live show. The source code of the website - its HTML tags - were performed alternately by several dancers; their movements were then described (by the audience and myself) and stored online into the (text/twitter-based) html-movement-library, either by accessing a laptop or using a smart phone. This information was immediately reused on stage as new instruction material for dance. I first had the idea to "perform" HTML in 2006, when I discovered a parallel between HTML tags (the language the Web is written in) and Butoh (a Japanese dance technique, which is based on "becoming an image" in the performance.) I found it intriguing that the Web browser treats the HTML tag in the same way... The browser becomes the information stored in each HTML tag. home/ursenal | Website Annotations performance - photos / movie. 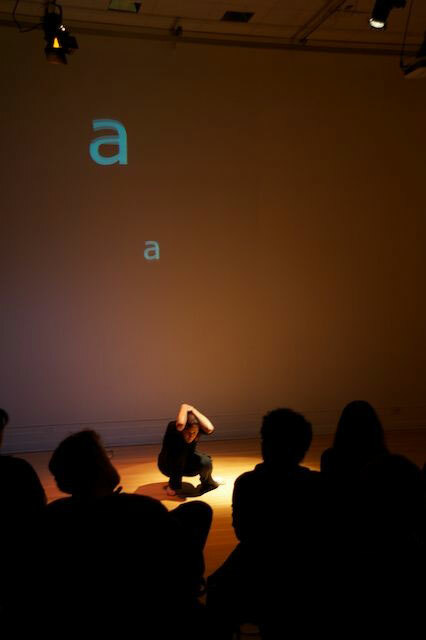 Documentation movie of performance @ School of the Art Institute of Chicago. Click to go back to photo documentation. For full Production Credits click here. The inclusion of the html-movement-library on stage enabled an ongoing and simultaneous exchange of instruction and performance, data and movement input and output, and a continuous transfer between Web and body, while breaking down the border of audience and performer. The public was an intrinsic part of the event and was invited to influence the course of the show. 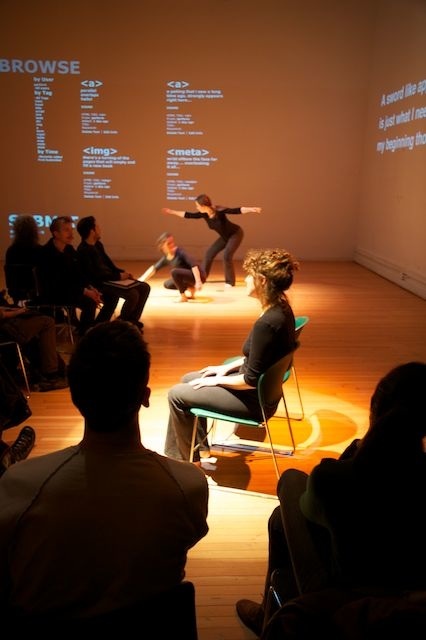 The audience could send in their movement annotations via twitter or sit down (joining me) at the table of the html-movement-library, and entry their own interpretations of the solo-dancer's movements into the database. This information was re-used on stage as new instruction material. As the data performance progressed, more html-movements are developed, stored and altered by all the participants. 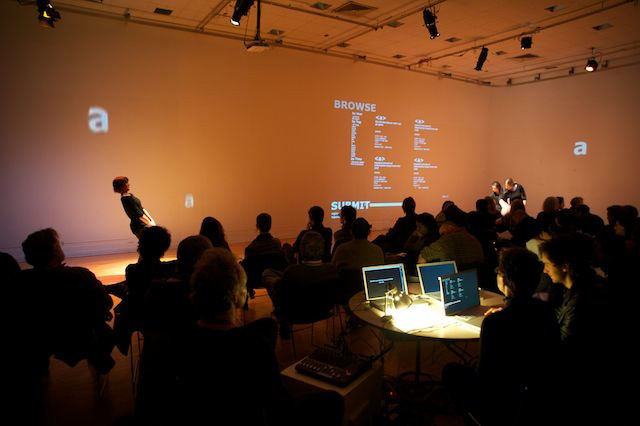 The sound was a mix of different sources, a score composed by the live source code of SAIC.edu. Each HTML tag from the site was musically interpreted. Tags such as HEAD or TABLE were translated into music by reading their letters as a musical score. Letters which did not match those of the musical scale were interpreted by a different theme. On another acoustic layer a computer voice was reading aloud the directions from the database. On yet another level resided the live-mix of the online work html_butoh.